To assist in the comfort and well being of all persons who are hospitalized in the Community Memorial Hospital. Pictured back row: L-R Lindsey Haskell, Foundation member; Rita Nelson, Norma Patterson, Marlene Brugger, Mickey Harms, Renee Tracy, Auxiliary members; Scott Domke, Foundation President. Front row: L-R Jordann Hansen, Foundation Vice-President; Phyllis Kent, Marge Gallup, Dawn Oakley, Auxiliary members. 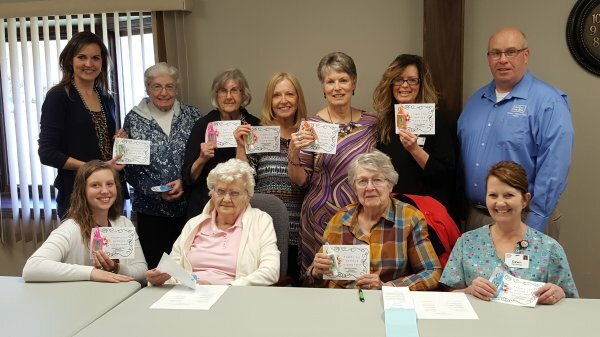 On Wednesday, April 25th the CMH/Clinic Foundation honored the CMH Auxiliary in observance of National Volunteer week with a gift of appreciation at their monthly meeting. 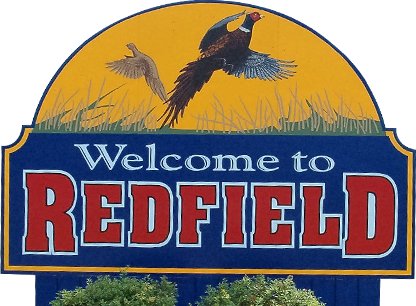 The Auxiliary sponsors two fundraising events for the Redfield Clinic and hospital’s patient and equipment needs. The two fundraiser events are the CMH Auxiliary Craft Fair held in October and a Luncheon held in January. Redfield Community Memorial Hospital Auxiliary has developed a new campaign. They purchased clothing, size 9 months to size 14 for our patients that present to Community Memorial because of a motor vehicle accident or a chemical contamination and other reasons they may have come in. Dawn Oakley attended a First Receiver Decontamination class in Watertown in March. They talked about our “little patients”, how these traumatic things can affect them. Sometimes their clothes are contaminated, bloody or has glass shards in them and need to be removed. If they are not injured and able to leave the hospital it is nice to put a clean new set of clothes on them. The Auxiliary purchased 30 outfits and they will be used as needed. They will replace them when needed. This is an ongoing campaign to benefit the children of our area. There’s A LOT going on at the Redfield Clinic and CMH! The Hospital Auxiliary holds a Craft Fair in the fall and a Soup/Sandwich in January with all the profits of these events going to the Foundation. The Foundation aides the Community Memorial Hospital and Redfield Clinic in purchasing equipment that are needed for the facilities. The Community Memorial Hospital Auxiliary has donated more than $5,000 to the Hospital Foundation from money that they raised during various fundraisers throughout the year. Anyone can be a member who is interested in helping patients and the people who serve them. Meetings are held in the Community Memorial Hospital’s Conference Room on the fourth Wednesday of each month, September thru May. The Auxiliary sponsors at least one major Fund Raiser a year to help support the hospital and clinic. 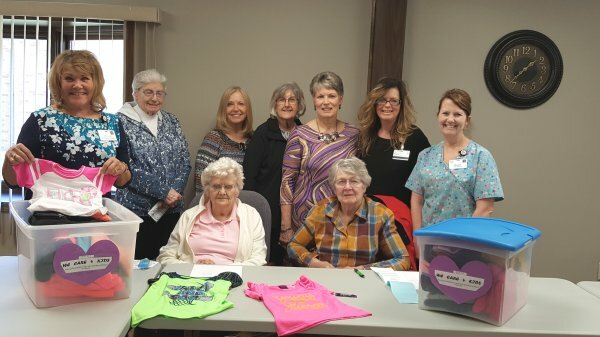 In recent years the Auxiliary has held a Fall Craft/Vendor Fair in October and a Soup/Sandwich Luncheon in January with the proceeds going to the Community Memorial Hospital and Clinic Foundation. 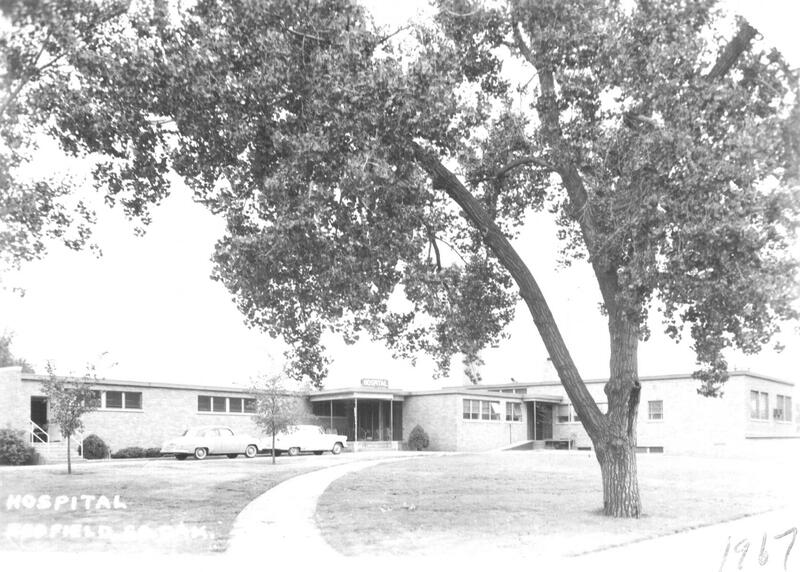 The first meeting of the Community Memorial Hospital Ladies Auxiliary was held on February 13, 1951 at the Hospital. The organization began with the enrollment of 45 women. Those present opened each meeting giving the pledge of allegiance to the flag of our country followed by reading in unison of "The Auxiliary Prayer". The first thought of the Auxiliary members as they looked at the task before them in 1951, was that they needed more members to accomplish all the tasks that loomed before them and so several membership drives were conducted in the first several years until September 1956. At that time the Auxiliary showed a membership of 432 members. With so many members, the Auxiliary was divided into Committees and each had a Chairman and a task to do. A Fund Raising Committee, with the support of the members, did many things to raise money during those early years. A Sewing Committee was formed with the members doing regular mending at the hospital, plus making terry cloth slippers and robes for children, adult robes, slippers, pajamas and patient bibs. There was a group led by Mrs. Clinton (Darlene) Dykstra, the Redfield School Nurse, that sponsored the Future Nurses Club in the early years. Some of the Auxiliary members served as "pink lady" volunteers, having also sewed their smocks. These first years were busy, productive years at the Hospital and the Auxiliary kept up with the needs. The Auxiliary met for their regular meetings in various place over the years. Loving God, Bless us, we pray in our various endeavors in Hospitals and Nursing Homes in which we strive to bring comfort and hope to all who are in distress of mind, body and spirit. Guide us so that we may use the privilege given to use to help the aged, the ill, and the very young with generosity, with discretion and with gentleness. Contact Judy Carroll at Community Memorial Hospital: 472-1110 for information to become an Auxiliary Member.